In most cold climates, forced air heating has replaced steam and hot water systems as the predominant method for heating a home. The heart of nearly every forced air heating system is the furnace. Gas furnaces come in a variety of sizes, types, and efficiencies to satisfy almost any application. A furnace consists of two or three main components depending on the fuel source. 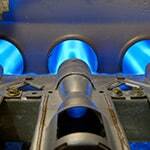 Oil, propane, and natural gas furnaces use a burner to combine fuel and air and then burn the mixture to produce heat. In all furnaces, this heat is then transferred to the air via a heat exchanger. In electric furnaces, the heat exchanger also converts the electricity into heat. Finally, a blower distributes this warmed air throughout the house. Furnace burners are often designed to operate in one of three ways. The first and most common is a single-stage burner. A furnace using a single-stage burner has only two operating modes, on or off. Single-stage furnaces will always operate at the rated capacity regardless of conditions inside or outside of the home. This operation often leads to inefficiency when conditions are mild. To address the inefficiency with traditional burners, two-stage burners were introduced. A furnace using a two-stage burner has a total of three operating modes, off, low-fire, and high-fire. High-fire is exactly what it sounds like and in this mode, identical to the single-stage furnace, producing its full rated capacity. Low-fire is an intermediate step that allows the furnace to operate at some factory set level less than the maximum capacity. This level is typically 40%-60% of the rated capacity and will allow the furnace to better match a home’s heating requirements in mild weather. This leads to a more comfortable home, and a lower fuel bill. Expanding on the benefits of two-stage operation, modulating burners can operate at almost any output. Modulating furnaces have a minimum and maximum heating capacity but can operate at almost any point within this range. By constantly monitoring conditions and adjusting output to account for any changes, modulating furnaces are able to eliminate large temperature swings sometimes present with other types of furnaces. They also maximize efficiency by using the minimum amount of fuel to satisfy heating demands. 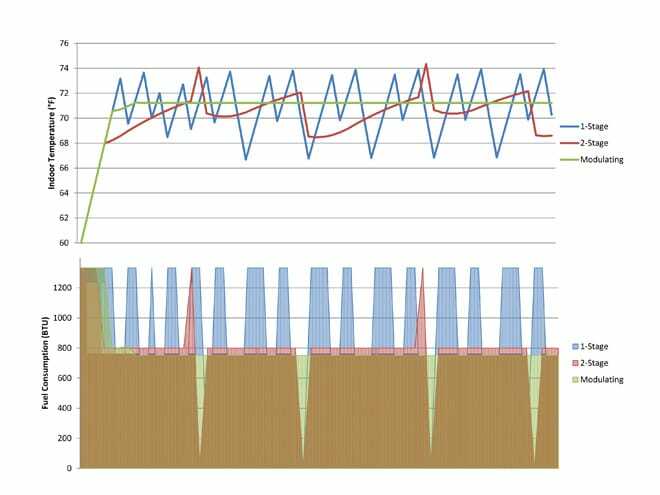 The charts below show a simulation of average temperature and fuel usage for single-stage, two-stage and modulating furnaces. As you can see, the 2-stage and modulating furnaces maintain a more stable temperature than does the single-stage unit. The 2-stage and modulating options also offer savings of approximately 8% and 10% respectively when compared to a single-stage model, even when all three have the same rated efficiency. 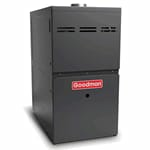 Furnace blowers come in two main varieties. These are multi-speed and variable-speed. A multi-speed blower allows the installer to select a speed for each type of operation at the time of installation (e.g. medium speed for heating, high speed for cooling, low speed for fan operation). The blower then operates at the designated speed when the associated operation is required. The blower does not respond to changes in operation such as dampers opening in a zoned system or a filter gradually becoming clogged. Like with a multi-speed blower, an installer sets the operating conditions for a variable speed blower at the time of installation. However, instead of picking a speed that provides the approximate air flow rate desired, the speeds on variable speed often correspond to a specific air flow rate. The furnace then monitors flow rates, temperatures, and other information and adjusts the blower operation to maintain ideal operating conditions. This allows variable speed blowers to respond to changes in conditions and provide optimal comfort. In addition to the blower control options outlined, there are three types of motor technologies available. The first is a permanent split capacitor motor or PSC motor. This is the most common motor technology and is found primarily in furnaces using multi-speed blowers. Another common motor option is an electronically commutated motor or ECM. ECM’s are primarily used in variable speed applications and have very flexible programming options to respond to system conditions. ECM’s can reduce the electrical costs of operating a furnace by approximately 25%, while also providing superior comfort. Constant torque motors, sometimes called X13 or by some other trade name, are a compromise between the value and simplicity of a PSC motor and the efficiency and performance of an ECM motor. 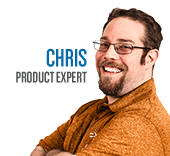 Constant torque motors use the same motor technology as ECM’s but eliminate much of the programmability. This results in a motor that is nearly as efficient, but less responsive and substantially cheaper. AFUE, or the annual fuel utilization efficiency rate, is a measure of furnace efficiency. AFUE can range between 80% (the federally mandated minimum) to 97%. Most manufacturers continue to offer basic single-stage, multi-speed, 80% AFUE models for the budget-minded consumer. However, models with AFUE rates of 90% or higher are becoming more and more common. In fact, a federal mandate requiring furnaces installed in cold climates to have an AFUE rating of at least 90% nearly took effect in May 2013. Most models with AFUE rates of 90% or higher use condensing technology to capture as much of the heat available from combustion as possible. A condensing furnace will condense water vapor from the combustion process back into a liquid. This process releases a substantial amount of energy that can then be used to heat your home. The AFUE rating is a great way to compare energy efficiency between models, but may not accurately reflect the efficiency of the unit once it is installed. Duct sealing, insulation, and routing, as well as filters and humidifiers, can all impact operational efficiency. It is important to address any existing issues in these components to ensure your system can operate at peak efficiency and keep your home comfortable. Furnaces come in a variety of orientations to satisfy all varieties of installations. 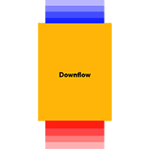 The orientations for furnaces include upflow, downflow, horizontal, and low-boy. There are also furnaces that can be installed in a number of different orientations. These are often called multi-position or use a combination of the possible orientations, e.g. 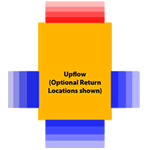 upflow-horizontal. can be located on either the bottom of the furnace or on either the left or right side of the blower compartment. Upflow systems are commonly used when the furnace is installed in the basement or in a closet, with the ductwork above the level of installation. Downflow furnaces have a return connection near the top of the furnace and supply heated air out the bottom of the furnace. Return air is typically routed directly to the top of the furnace. 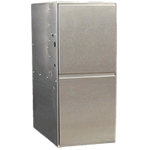 Downflow furnaces are used in applications where ductwork is installed below the furnace. This is common in homes with ductwork installed in a crawlspace or in commercial buildings where ductwork was installed within the slab. Horizontal furnaces typically have a return connection at one end and a supply connection at the opposite end with both connecting horizontally. Horizontally oriented furnaces are typically used in attics, crawlspaces, and other areas with limited height. Low-boy furnaces have both supply and return connections at the top of the furnace. This design results in a shorter, but wider unit. Low-boy furnaces were common in older homes, but are being gradually replaced with other types of units. 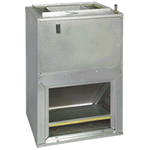 An upflow furnace is often a suitable replacement for a lowboy model, but duct reconfiguration will be required. Furnaces have two primary venting configurations. The first, found only on 80% AFUE furnaces, is chimney venting. Chimney vented furnaces have large vent connections and rely on the natural buoyancy of hot air to exhaust combustion gasses and draw fresh air into the furnace. To make sure this process is working correctly, they require large chimneys. Higher efficiency furnaces have built-in inducer blowers to assist with exhaust spent gasses and pull fresh air through the furnace. These are typically called direct vented and can be exhausted either vertically through a ceiling or horizontally through a side wall. Direct vented furnaces use smaller venting than do chimney vented furnaces and often pull fresh air directly from outside. 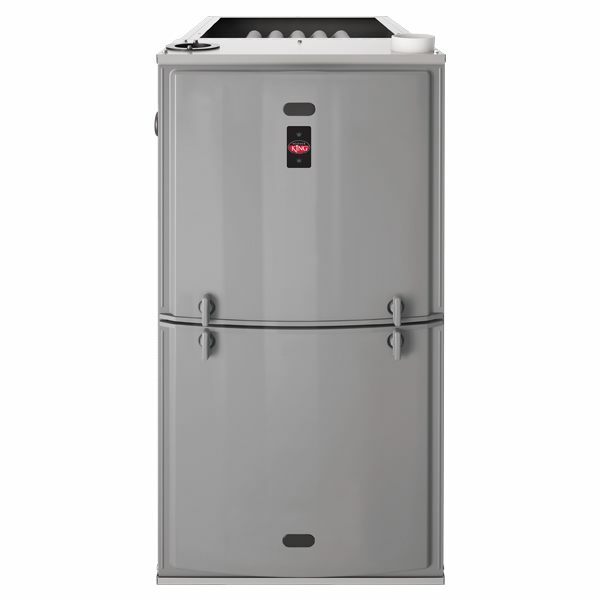 Furnace Buying Guide - How to Pick the Perfect Furnace. Our heating, ventilation and cooling equipment how-to library can help you pick the perfect comfort solution for your home.